To support the demands of the 3rd Platform—including, but not limited to, mobile, social, cloud, and analytics workloads—an organization’s storage infrastructure must be flexible, cost-effective, and provide first-rate data protection measures to reduce the risk of ransomware infections. 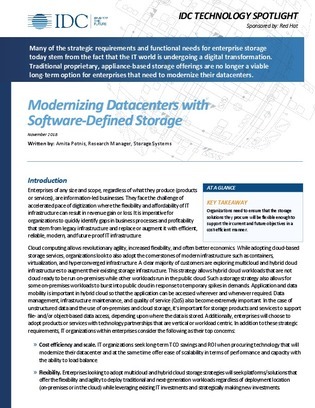 This IDC paper spotlights the benefits of implementing software-defined storage to support 3rd Platform applications and technologies, as well as examines the strengths and benefits of Red Hat Gluster Storage, one of many strategic offerings for the 3rd Platform. Read on for the complete analysis.